There's been a trend in games lately to remake older classic titles and add a modern flair; titles like Pac-Man Championship Edition and Space Invaders Extreme come to mind. The latest title from the 80's era of arcade and home gaming has been remade, and that is Arkanoid. Known as the single player Pong, Arkanoid has players controlling a paddle and a ball to remove rows of blocks from the screen. The latest version, Arkanoid Live, continues that gameplay trend while adding some new features and gameplay elements - most notably co-op. The first thing you'll find that Arkanoid has done differently is the addition of enemies, though I use that term loosely. These enemies are launched from the top and can redirect your ball when hit - but they never actually hurt or kill you. Breaking blocks will also yield powerups for your paddle. These range from growing your paddle (stop giggling), multi-ball, and even adding the ability for your paddle to shoot. Only one effect can be used at a time, and the powerups appear to be somewhat random. The main draw for us with Arkanoid Live is the addition of a two player co-op mode. 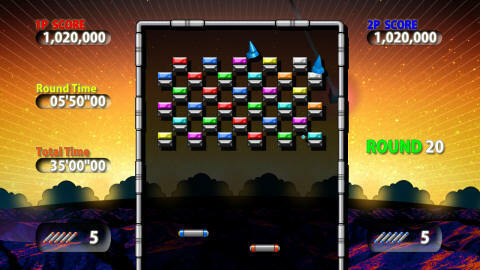 This mode uses the single player puzzles and stacks the paddles of the players. Think of it like doubles tennis where one player is closer to the net. After every puzzle the players alternate positions. What this provides is sort of a cushion in the game and slightly more room for error. If you just miss a ball up front, you usually have a partner just behind to back you up. In other situations it allows both players to pick up different powerups to play off of each other. Perhaps the rear player has the larger paddle (stop giggling) while the player in front has the catch powerup, which allows you to catch and hold the ball. These kind of strategies can help in some of the trickier levels where you'll need to squeeze the ball into a tight pathway (stop giggling). 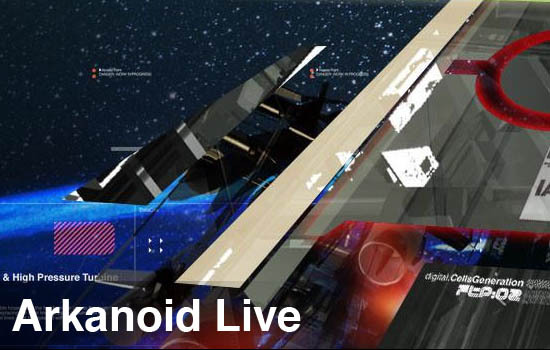 Arkanoid Live features local and online co-op, so it shouldn't be too hard to find someone to play with. The real question though is - does Arkanoid really warrant co-op play? To some degree it makes the game a bit easy, though we did find ourselves both missing shots and losing more often than I thought. Communication was actually pretty key as well, but the player in the rear simply felt a bit useless a lot of the time. The best times in the game were during the multi-ball powerup where both players were frantically attempting to keep everything in play. Like the previous remakes before, Arkanoid Live is a solid title, one that fans of the series are sure to love, and one that newcomers will find some fun in. Just don't get stuck in the rear (stop giggling). The Co-Op Experience: Enjoy classic Arkanoid gameplay with a friend as you clear levels of blocks.